On Saturday, April 28, 2012 from 10 a.m. to 2 p.m., local law enforcement agencies will be working with the U.S. Drug Enforcement Administration (DEA) to safely and legally get rid of your unwanted, unused, and expired prescription drugs. The Grand Junction Police Department, Mesa County Sheriff’s Office, Palisade Police Department, and the Fruita Police Department all will be participating in the fourth National Prescription Drug Take Back Day. One of the main reasons local law enforcement is participating in National Prescription Drug Take Back Day is because of the major rise in prescription drug abuse. By participating in this event you can save lives by helping decrease the amount of prescription drugs that fall into the wrong hands. According to the Centers for Disease Control (CDC), in 2008 more than 36,000 people died from drug overdoses, and 20,044 of those deaths were due to prescription medications. Of those, 14,800 were from narcotic painkillers. That amount is nearly four times higher than it was a decade ago. In fact, more people die in America a year from prescription drug abuse than cocaine and heroin combined. And, it’s sometimes harder to find prescription drugs being used illegally because it can be harder to determine if they are in fact being abused. Grand Junction isn’t immune to these problems. The Western Colorado Drug Task Force, which the Grand Junction Police Department is a part of, comes across people abusing prescription drugs just as often as they do illegal drugs. And, although prescription drug abuse is most often seen in younger generations, we do come across older people abusing them too. Recently area school resource officers have also seen a spike in the number of cases of younger people abusing over-the-counter cold medications, commonly called Triple C’s and Robo-ing, too. Perhaps what’s even more alarming is that the Drug Task Force has been noticing poly-drug use, which means using more than one drug at a time. Prescription drugs, illegal drugs, even alcohol and caffeine, are often used together in various combinations. Poly-drug use can be extremely dangerous because people do it to counteract the different effects of the drugs they are taking, or to enhance the high they get from them. However, the combinations can be extremely destructive to your body and sometimes even make your heart stop beating. People often think that prescription medication can’t be bad for you because a doctor has prescribed it, but when people are abusing the drugs they aren’t being used as prescribed, and that’s where the danger is. If you are someone who has been prescribed medication, you need to do your best to prevent abusers from getting their hands on it. Abusers are willing to steal from family and friends, even go through the trash to find medicine. Kids will go through their parents’ medicine cabinets, or go to friends houses and go through their medicine cabinets. You need to do everything possible deny access to your medication. Help make our wonderful community a safer place. 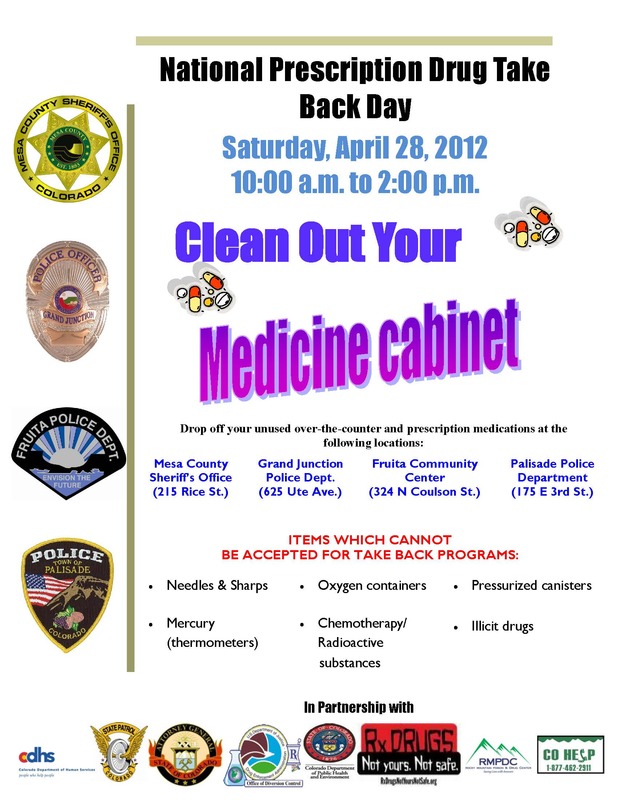 On Saturday, April 28, 2012 from 10 a.m. to 2 p.m., local law enforcement agencies will be working with the U.S. Drug Enforcement Administration (DEA) to safely and legally get rid of your unwanted and unused prescription drugs. The Grand Junction Police Department, Mesa County Sheriff’s Office, Palisade Police Department, and the Fruita Police Department all will be participating in the fourth National Prescription Drug Take Back Day. This national event seeks to prevent pill abuse and theft. On this day, local law enforcement and the DEA will be collecting potentially dangerous, expired, unused, and unwanted prescription drugs for destruction. The service is free and anonymous. Simply stop by one of the listed locations and put your medication into the collection box, no questions asked. 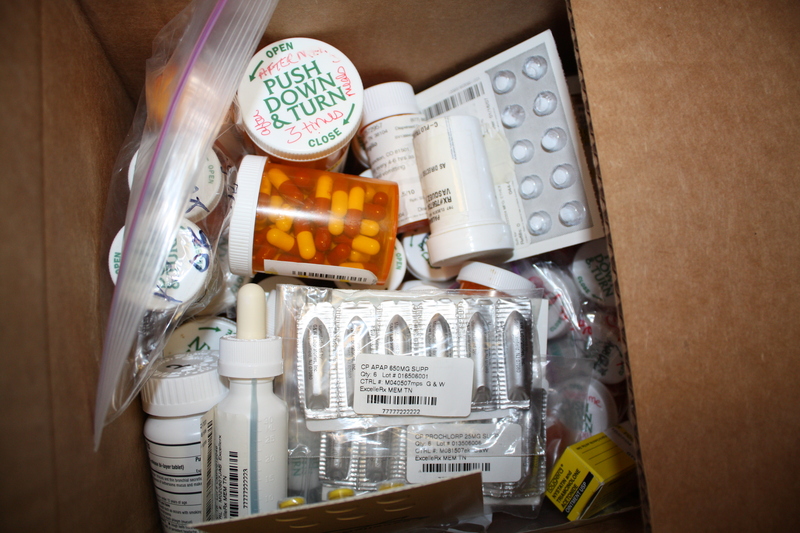 During the first ever National Take Back Day, which was held on September 25, 2010, a combined total of 204.6 pounds of prescription drugs were collected by the agencies in Mesa County. Since then, area residents have disposed of hundreds more pounds of unused medications through this popular program. This initiative addresses a vital public safety and public health issue. The DEA states many Americans are not aware that medicines in their home cabinets are highly susceptible to diversion, misuse, and abuse. Rates of prescription drug abuse in the U.S. are increasing at alarming rates, as are the number of accidental poisonings and overdoses due to these drugs. Studies show a majority of abused prescription drugs are obtained from family and friends. A very nice man by the name of Walter stopped by the police department this morning. 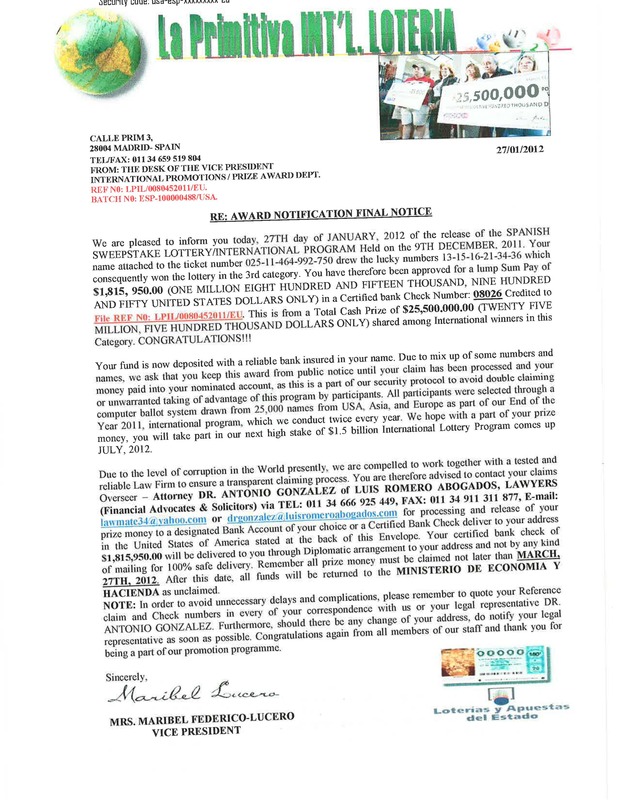 He wanted to share a piece of mail he received recently that included an “Award Notification Final Notice,” claiming Walter had just won more than a million dollars in the Spanish Sweepstake Lottery Program. Unfortunately, for all too many people, these types of scams do work, which is why there are so many of them going around. If the scammers weren’t getting people’s money, then they wouldn’t be wasting their time sending these scams around. We get multiple reports a week from people letting us know they received “a strange phone call,” or “something suspicious in the mail.” That’s why each and every one of us needs to be alert to possible attempts to steal our hard-earned money. I’ve included a copy of the “Award Notification” Walter brought in. He said if it helped keep even one person from becoming a victim then his trip down to the police department was well worth it. Walter also said he’d spread the word with family and neighbors, in hopes of making sure they don’t become victims either. That’s very helpful too. Like Walter, we hope that you too will share this information with family and neighbors. If you do receive something similar to this in the mail, simply tear it up and throw it away. Or, if you get that phone call that just doesn’t seem right and it sounds like someone is fishing for information, simply hang up. You don’t have to report it to us unless you actually give out your personal information or do have your money stolen. We’re just hoping that by spreading the word we can help prevent that from happening in the first place. Grand Junction Police Traffic Officers have heard a lot of reasons: “I was turning up a song on the radio”, or “I dropped my burger and wasn’t watching.” The problem is the number of rear end crashes in our city is becoming a big problem, and officers responding to crashes are hearing these very things from drivers on the streets of Grand Junction all too often. In 2011 there were 483 rear end crashes, which is about 50% of all crashes. Traffic Unit Sergeant David Stassen has heard many excuses as to why rear end accidents happen. To bring down the total amount of rear end crashes, which happen when drivers are following other vehicles too closely or they are not paying attention while driving, the GJPD is stepping up our enforcement in the high crash areas. The three major enforcement areas are the entire length of North Avenue, the entire length of F road, and Highway 6&50 from Mesa Mall to 1st Street. The majority of crashes happen in these three corridors. Another way you can tell if you are too close to the car in front of you is by picking a point on the roadway in front of you. When the car in front of you goes over that point begin counting for two seconds (one-one-thousand, two- one-thousand). If you cross the point before you get to two-one-thousand, then you are too close. So, who’s getting into these types of crashes? The majority, by far, involve younger drivers, ages of 16-20. People 25-34 are the next highest age group, followed by people 55-74. The good news is it’s fairly simple to prevent rear end crashes, and crashes overall. All you have to do is pay attention to your driving. Don’t talk or text on your cell phone, don’t eat while driving, don’t mess with your radio or iPod. Just pay attention and leave plenty of space between your car and the car in front of you. If you don’t, and you do end up crashing into the car in front of you, you could face a fine of $177, and even worse, you run the risk of injuring yourself, your passengers, or someone in another vehicle. “When you think about it, it’s just common sense,” adds Sgt. Stassen. “Unfortunately, too many drivers are in too big of a hurry, are thinking about too many things, or just have some very bad habits. So, you have to ask yourself, is crashing your car worth all of that? 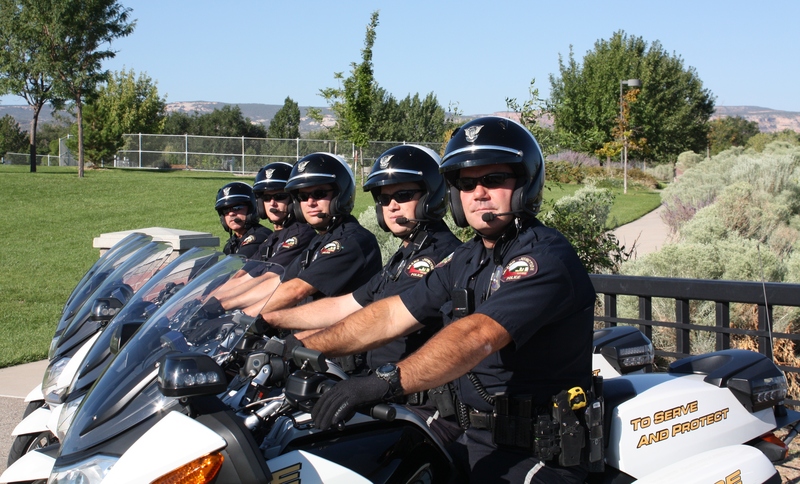 Learn more about the GJPD Traffic Unit and the monthly “Traffic Law Highlight” by visiting http://www.gjcity.org/Traffic_Unit.aspx. You’re probably seen it on television- a crime scene investigator in a white coat, bending over a lab table with only a desk lamp lighting the room, pulling fingerprints out of thin air. It makes for some great TV, as evidenced by a number of very popular television shows on the air right now. If only reality allowed us to do half the things CSIs can do on TV. That’s not to say there aren’t some very interesting and hi-tech jobs being done by our real life CSIs. For example, Trent Rundquist, a Grand Junction Police Department employee since 2007, is now certified by the International Association for Identification (IAI) as a Crime Scene Investigator. He passed the written test and recently received his “official” letter and certificate. This was a personal goal of his that he started working on last year. The Colorado Bureau of Investigation (CBI) only requires Rundquist to be certified by the IAI as a Latent Print Examiner, which according to the IAI website there is a 63% pass rate for Latent Print Examiners and only 870 in the world that are certified. But Rundquist didn’t want to stop there, which is why he took on this extra challenge for a job that he says he absolutely loves. There are three criminalists who work for the Grand Junction Police Department. Rundquist works as the Latent Print Examiner and the other two deal with chemistry, biology, and controlled substances. Thanks to a partnership with the Colorado Bureau of Investigation, our criminalists have state of the art equipment to help them in their work. This partnership began during the summer of 2008 when the GJPD criminalists moved in with the Colorado Bureau of Investigation (CBI) after that agency built a new facility in Grand Junction. Our criminalists handle GJPD cases first and then they branch out to the other agencies. 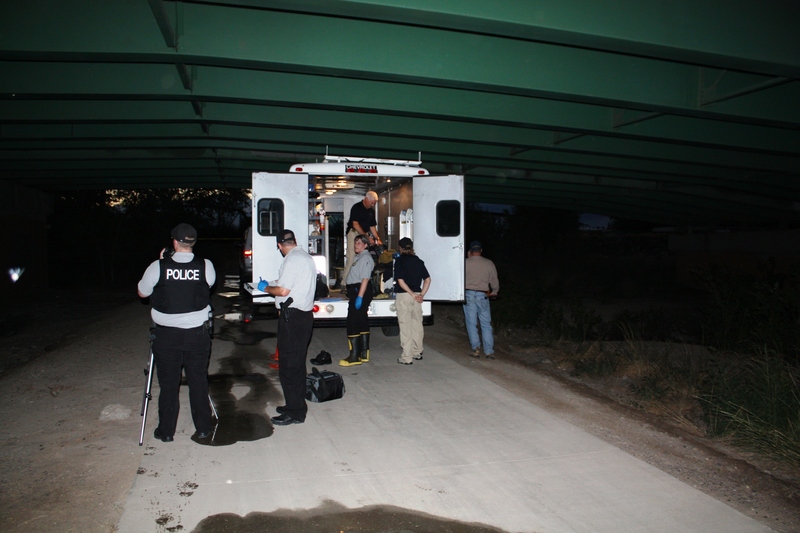 Because of the partnership, it’s not uncommon to find GJPD criminalists working alongside CBI investigators at their crime scenes. “It is a good opportunity for our criminalists to gain some good experience and knowledge,” adds Sgt. Oswalt. So, how do these guys jobs compare to what we all see on television? Rundquist said it’s common to be at a scene for at least 12 hours, not solving the entire case in one hour. He also wishes that the Automated Fingerprint Identification System (AFIS) worked like it did on TV- where you put the fingerprint in the system and it brings up the person’s drivers license. The AFIS does bring up a list of possible matches, and then Rundquist has to go through each person and pick out the correct match. His work is then checked out by another person. This process can be as short as couple of days or it can take a couple of weeks. Rundquist adds he also gets a laugh at how dark the labs are on the TV shows. In this profession you need as much light as possible. But hey, we can’t all work in Hollywood. This entry was posted in Uncategorized and tagged crime scene investigator. The Grand Junction Police Department, in association with the Mesa County Sheriff’s Office, and Mesa County Animal Services, is investigating two recent dog attacks that have resulted in serious injuries to two people. The first incident happened on the night of Sunday, December 4 near Whitman Park. In that incident a man riding his bicycle through the park was attacked by two dogs, resulting in multiple bites. The man was able to use his bicycle as a partial shield until someone eventually called the dogs off and the animals left the area. The man was treated and released at the hospital. The second incident happened on Monday, December 5 at about 8am in the area of 5th St. near Duck Pond Park. In that incident a man walking on 5th St. was attacked by four dogs. He received multiple severe bites before some people nearby scared off the animals. It is unknown if those people were associated with the dogs. The man then walked to a nearby business and called a taxi, which took him to the hospital. Neither victim was able to provide a good description of the animals, however the victims believe they were pit bulls. To help law enforcement identify and track down the animals, their owners, and potential witnesses. Residents who see dogs exhibiting aggressive or pack-like behavior in the Downtown area or near the river should call 911 immediately so we can dispatch officers and Animal Services to that location for further investigation. In the meantime, officers have increased patrols in the areas where these attacks have occurred and are jointly planning operations with the County to further identify and capture aggressive dogs. If anyone has information about these incidents they can call the Grand Junction Police Department at 242-6707, call Crime Stoppers at 241-STOP, send the information via the web at www.241stop.com, or text CRIMES to 241STOP and include your tip information. The City of Grand Junction and Mesa County require all dogs to be on leashes when they are not confined to a home or kennel. They also require all dogs to be properly licensed. Be aware of your surroundings to help avoid getting into a dangerous situation. Assume a non-threatening position and do not make eye contact. 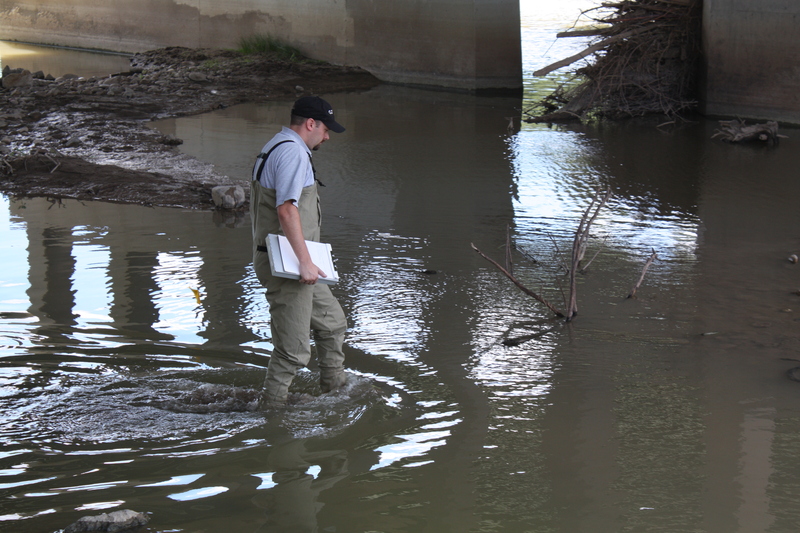 Stay upright and move toward a safe location when possible. More information can be found at http://animalservices.mesacounty.us/template.aspx?id=2358. This weekend officers and deputies from the Grand Junction Police Department, Mesa County Sheriff’s Office, and State Liquor Enforcement conducted compliance checks at 147 liquor establishments in the Grand Valley. The checks included sending an underage person into the business to see if that person could purchase alcohol. Of the 147 businesses checked, 18 sold alcohol to the underage person. The businesses that are out of compliance must go before the City of Grand Junction’s Liquor Hearing Officer or State Liquor Hearing Board, which will determine how the business will be sanctioned. Penalties could range from a fine to a suspension. A liquor license revocation would only happen if a business was determined to be a chronic violator. This joint agency operation was funded by the Enforcing Underage Drinking Laws grant that was given to the Grand Junction Police Department. The City of Grand Junction is offering FREE training for liquor license owners, their managers and employees.